You might not think so when you're looking around you on the streets, but every person's soul has gone through hundreds, sometimes even thousands, of lives during their development already and many more will follow. They learn something in every life, and this brings them a step further. They create karma, and later solve everything themselves. They experience and they learn. One soul does this faster than another, but we all develop. That is what everything is about in the universe: development. This doesn't happen for no reason, it's part of a Greater Plan. That plan has been devised by a being called the Creator, or Prime Creator. Many people see the Creator as the same being as God, but this isn't entirely true. There are many Gods, at least one for every universe. A God is an aspect of the Creator. Simply put, God is the manager of a universe, who has created and governs this universe together with the Creator. The Creator, on the other hand, has created everything. Every creation starts with an idea, and from that idea - the ultimate example of "mind over matter" - flows a new universe. Scientists call this a Big Bang. Not only our universe formed in this manner, but countless others as well. And they are still being formed. 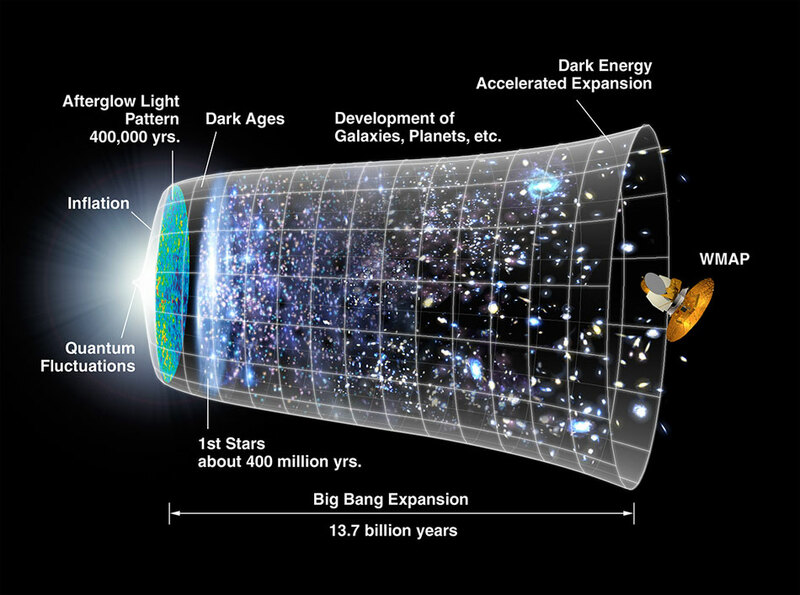 While you are reading this, big bangs are still continually taking place. 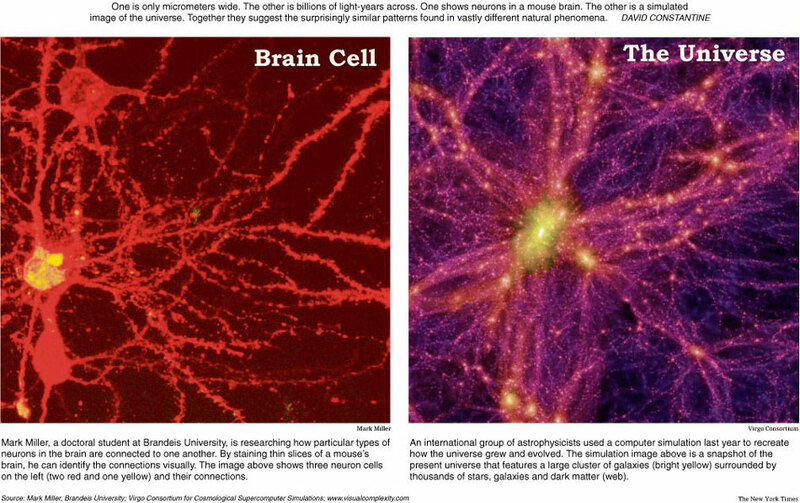 All universes together form the cosmos. This cosmos is not viewed from above by this Creator to change something once in a while, no - it is the Creator. The Creator is in everything that exists, and experiences it 100%. That is why there is consciousness in every particle, no matter how small (1). Of course the Creator is an entirely different creature than we are. No-one in the world (or outside of it) knows who or what It is exactly. In other cultures It is often simply described as "All That Is". This means you and I are also part of It. We are not separate from the Creator, we are the Creator. You can compare this to your own body. There are billions of cells in there as well, which all function on their own. Yet at the same time they're also all connected to each other and form one whole. You continually experience the weal and woe of your body parts. If a body part feels good, for example when it's being caressed, this uplifts the whole. But if something hurts, you also suffer with your entire body. This is the same in the cosmos. Through us, the Creator constantly experiences Itself in an endless variety of forms, vibrations, smells, and colors. It experiences Its deepest sorrow and Its highest euphoria. We are never separate from each other. This is impossible anyway, because every human being consists entirely of energy and all energy is connected to each other. This means that if we look at another person, we're actually looking at ourselves. It's like a finger looking at a toe. There is only one kind of energy, and that is the energy of light/love. Light is the same energy as love, but in a workable form, a form that can function as a building block. Einstein already discovered that everything consists of energy (E=mc²), but maybe he didn't know back then that this is all the same energy. Everything that's alive, and every element from the periodic system, is simply light energy that vibrates at a certain frequency. At different frequencies, small particles such as neutrons and protons rearrange themselves differently, and form different atoms, molecules, etc. For many scientists this is still complete hocus pocus. They believe that everything should be explained through traditional science and aren't very fond of 'intangible' concepts, such as the ones discussed in quantum mechanics. Especially if spiritual elements are involved as well, such as how there is consciousness in everything that exists. If you tell them that the researcher's thoughts and emotions influence the results of an experiment, they'll call you insane. They look through a microscope and conclude that if you look deeper than molecules, atoms and neutrons, really 'nothing' remains. This 'nothing' is light. Through energy transformers, such as our brain, every scientific element can be converted into another element using the correct technique. In other words, alchemy is only a matter of thought! Luckily there are more and more progressive scientists, for example Gregg Braden (3) and Nassim Haramein, who do understand this. They know that, although everything appears to be separate from each other, in reality all is one. This is also the most important Universal Law: the Law of One. This law describes this unity, and also means that everything that exists should attempt to eventually become as one with each other again, and with the source. God constructed our universe in different layers. These are also called dimensions or densities. It means that several parallel realities exist. The term dimension isn't used here in the same way as we usually use it nowadays (length, width, depth, etc.) but in the way of density, i.e. the frequency at which all energy vibrates. Each dimension is full of life. Beings in a lower dimension usually can't see higher dimensions (unless you have a special gift for it), but the reverse is true. Heaven is the best known parallel world for us, and is part of the fourth dimension, also called the astral world. Spirits of the dead are living in this dimension, and also other beings, such as extraterrestrial beings and nature spirits. Spiritually advanced humans and humanoid earthlings, like the American Sasquatch and Asian Yeti, can stay in this dimension for a short or longer period. The easiest way to do this is in spirit, while the body remains at rest on Earth. This is called astral travel. Someone who has enough control over their vibration, can also do with their body.They can disappear in one place and reappear in another. We ourselves live in the third dimension. In terms of the universe, this world is primitive and heavy. There are more than ten dimensions. The higher the dimension, the higher the vibration and the lighter and finer everything is. The soul goes through cycles. First it separates itself from the Creator's pure love energy, then it goes through countless lives in which it experiences many things. If all goes well, it will learn from these experiences and will continually climb up through all dimensions. Finally, when it has learned the final thing that can be learned, it once again becomes one with the source. Everything that hinders this evolutionary process is universally viewed as a sin. Action doesn't immediately have to be taken against this, but it does create karma. In order to experience itself optimally, the Creator decided to create some sort of theaterlike construction, with stage and backstage parts. The stage is the daily life you lead, in your physical body. Backstage is the soul, which is part of your oversoul, your higher consciousness. In your higher consciousness you have full vision of all that goes on. In your daily life you learn your lessons, and in the hereafter your soul evaluates how this went. Then you choose the next step in your development. The fact that you are closed off from the full consciousness in your daily life is one of the few "illogical" things in the entire creation. Everything else has been put together logically, and energy always follows the smoothest road. If every living creature always already knew everything, and also knew that all other creatures knew everything, there would be a lot less to discover. And gaining experience was the idea of the entire plan. Then what is there still to be feared in this life? Death? Certainly not, death is experienced as a wonderful holiday by souls who return to heaven after the heavy life on Earth. The illuminati? Of course not. Whoever can view the greater picture knows that the dark forces only exist in order to make people experience something like duality (good and bad in one society), which teaches the soul a lot. And that those dark forces are only allowed to go as far as the Light permits them, the overall balance may never be disturbed. Should you be frightened then of people who have bad plans for you, or perhaps of extraterrestrial beings? Again, no, because they're all in the same situation as you are. We're all parts of God that experience ourselves and each other, and try to develop ourselves. Even someone who hurts you or might even kill you, you will see again in a higher dimension. And you will both know what lessons you've learned from this. The outside world is actually not important at all, you will end up in thousands of different worlds during your development. All that counts are your behaviour, your intention, and your choices. There is only one thing you should try to avoid, and that is wasting your life by being selfish, loveless, vengeful or ungrateful. If you don't learn your planned life lessons, you'll have to do it again later. Although a life is never entirely wasted, not making use of chances is one of the biggest disappointments a soul can experience. You really don't have to completely rearrange your life once you understand it all. If you simply do your best and not only bear in mind your own interests when making decisions, but also those of others, it can't really go wrong. After all, making mistakes is inherent in life; what matters is that you learn from those mistakes. Whoever manages to improve themselves and dissolves karma makes use of their chances for development. A clever principle you can apply to future choices you must make is: if I'll have completed this life and start to evaluate, what would make me most proud? If you approach it like this and remember that not social success, but love is the criterion, you can't really make the wrong choice. If you wish to do more and want to actively help to improve the world, then that's a good idea. Helping others is also a sign of development. It is seen as the greatest good in the universe. "If you wish to make others happy, practice compassion. If you wish to become happy yourself, practice compassion"
There are plenty of things you can do, even without leaving your home. The universal Law of Attraction can be helpful here. If you know that all your thoughts, actions and intentions are being registered in the collective consciousness, and that our collective consciousness creates our future, it's easy to contribute to this yourself. This will literally be accepted with gratitude by every living being on Earth. - Be a good person. Be kind to others, and to yourself. Be brave. As actress, Zoe Saldana, (Neytiri from the film "Avatar") said: "You can only grow from experiences you don't actually dare to do." These don't necessarily need to be big things, such as giving an inspirational speech in front of a full audience. It can also be something small. Such as standing up for someone, or giving money to a charity even though you don't know whether you'll be able to get by that month. Make sure you can be proud of yourself in everything you do. - Visualise a better world. Make time for this every day for five minutes. Imagine how you would like the world to look in the future. Visualise pleased and happy people, who live together in peace. There is enough food and everyone gets pleasure out of each other and out of the beauty of our planet. Feel the happiness you would feel if this world were already here, and you were part of it. Enjoy this happiness from head to toe. This directly influences the collective consciousness and makes our world a little better. Not just a little bit, because the Law of Attraction works a hundred times stronger for postive thoughts than for negative ones (5). So every small visualisation makes a large difference. - Protest when you see injustice. Join protest campaigns for the common good, or start them yourself. The illuminati are frightened by the people, which is why they do everything in secret and try to keep us weak. Their worst spectre is hordes of protesting people in the streets demanding their departure. So do this as often as possible. It doesn't have to be out on the streets, it can also be done online. There are websites that make this very easy (6), (7). Many successes have been scored this way. But of course you can also send emails yourself or call members of government, administrations, media or companies that support the current corrupt system. Remember: no matter how small, every little bit helps!